What better way to cool off and relax after a hot, dirty tractor restoration project than to dip into the cool waters of the North Florida springs? The question Speedy & Laura get asked most frequently, is "What do you see in there?" We've never been able to adequately answer it with words, but now we can direct people to this little corner of our website! Warning! 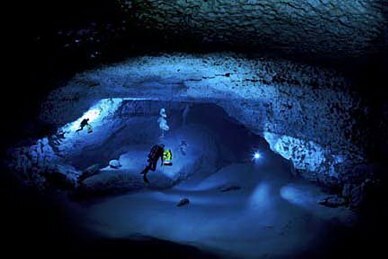 Cave diving can be an extremely dangerous activity, resulting in serious injury or death. Never, ever venture into an underwater cave without the proper training and equipment. 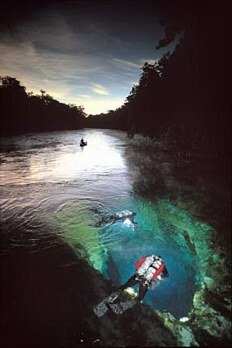 © Wes Skiles/Karst Productions, Inc.
Two divers in Ginnie Springs, near High Springs, FL. 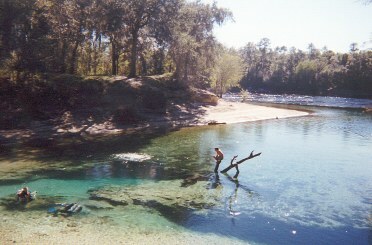 The entrance to the Devil's Ear system in the Santa Fe River, at Ginnie Springs. © Wes Skiles, Karst Productions, Inc. This is one beautiful shot! 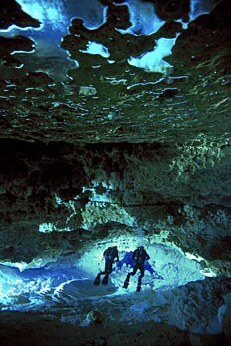 This is a very deep cave in the Floridian Aquifer; it took a major investment of time, equipment, and support divers to yield this most impressive result. Wes Skiles sells these great prints at http://floridasprings.com/images.html. Here's some of our diving pix--more coming soon! 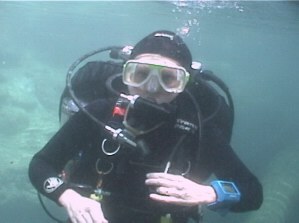 This is a still from digital video of Laura surfacing after a dive at Cow Springs, near Luraville, FL. 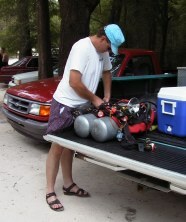 Speedy gearing up at Little River. many divers use scooters there. Doesn't the water look awesome? That's the Suwannee River in the background.